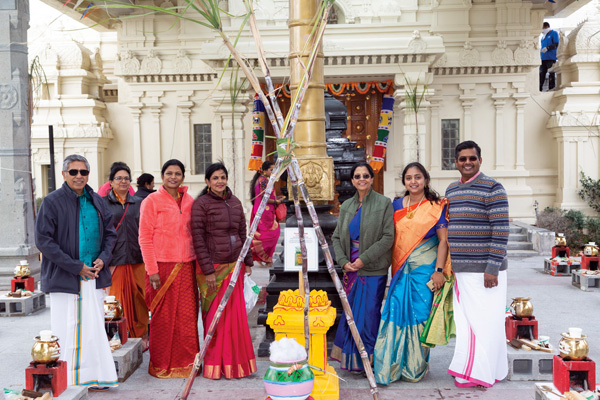 PEARLAND — Despite cold weather, there was an overwhelming participation of enthusiastic devotees in outdoor Pongal celebrations at Sri Meenakshi Temple on January 19 th , 2019. Pongal is a popular harvest festival of south India that marks the return of the sun to the northern hemisphere. It’s celebrated to reaffirm and appreciate the many significant sacrifices of our ancestors, quite like Thanksgiving in America. Pongal is the only festival of Hindus that follows a solar calendar. More than 100 families, several out of town, came to prepare pongal in the Raja veedhi, which is in front of the main temple. Silpi Ramanathan made a look alike bullock cart, and a cut out of the cow, adding a nice touch to the ambience of the whole place. Gho Pooja for the first time offered at Pongal event was very well received by devotees. Gho Puja is done to honor the Mother of the Universe. The cow represents a symbol of all Gods unified in one form. Though the day started out cold, Surya Bhagavan (Sun God) graced us with his bright presence during pongal preparation. The temperature soon warmed up to the cozy heat from all the wood burning stoves and so did the tempo with traditional pongal music. Pongal was cooked in beautifully decorated brass pots on stove made with clay and wood used as fuel. Rice and milk are boiled in a pot till the pot starts overflowing. The overflowing pot symbolizes fulfillment. When milk started to boil over, everyone shouted out, “Pongalo pongal!” The ambience was very similar to what you would see in the villages of South India. The festive atmosphere was enhanced with a group of energetic ladies performed Kummi, a popular South Indian dance where the rhythm and beat were maintained with clapping since instruments were not present in these folk dominant regions of India. Priests offered the delicious Pongal prasadam to all four deities inside the main Temple: Siva, Meenakshi, Venkateswara and Padmavathi with a special aarthi. Chairman Dr. Padmini thanked silpis for the hard work in setting up the stoves and beautiful decorations, which was a visual treat. She also thanked priests, staff, board members, advisory council and volunteers for making this event successful.